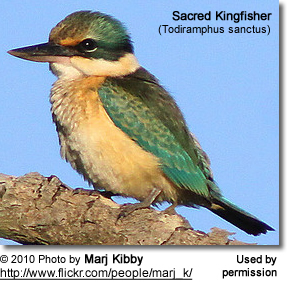 The Sacred Kingfishers (Todiramphus sanctus) are also known by their Māori name Kōtare. 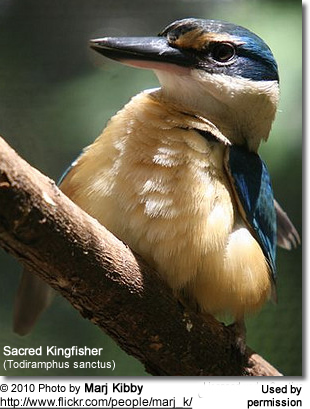 Sacred Kingfishers are native to Australia, Fiji, Indonesia, New Caledonia, New Zealand, Lord Howe Island, Norfolk Island, New Guinea, Solomon Islands, Eastern Indonesia, much of Northern and Western Melanesia, and the Kermadec Islands. They are found throughout most of Australia - except for the dry interior deserts. For the breeding season, they migrate south to their breeding territories in Australia in August or September. They also breed in New Zealand, New Caledonia and New Guinea. Occasionally, they will travel to Christmas Island (in the Indian Ocean), Malaysia, the Marshall Islands, the Federated States of Micronesia, and Nauru. For the winter, those birds inhabiting the southern two-thirds of Australia migrate north to New Guinea, east to the Eastern Solomon Islands and west to Indonesia. Some vagrants travel as far west as Sumatra - an island in western Indonesia. These forest-dwellers are often found in mangroves and trees along the paths of rivers. Those occurring in Australia frequent eucalypt forests, melaleuca forests (an Australian wetland tree), woodland and paperbark forests. In New Zealand, the subspecies T. sanctus vagans displays altitudinal migration after the breeding season, moving from the higher altitudes and forests to coastal regions and open ground. These Kingfishers are diminutive birds whose colors range from a bright yellow on the body to blue or green on the wings, tail, and head. The head also displays striping, but the female’s stripes are duller than the male’s. Their bodies are unusually configured. All Kingfishers are known for their stocky bodies, large heads and long, thick, sharply pointed bills, shaped like a dagger. The bill seems disproportionate to the rest of the body, but it is designed for impaling and capturing its prey. Their legs are short and their tails broad and stout. Their strong feet support them while perching on branches. They measure 19–23 cm (7.5–9.1 in) in length. After mating, both male and female prepare the nest—a burrow in a sandy riverbank, termite mound or a large, empty branch. The pairs will spend between three and seven days working to complete their tunnel. Some birds attack their worksites so forcefully that they have fatally injured themselves as they fly into the tunnels during these excavations. Nests constructed in hard, less penetrable ground will have tunnels that are shorter than those dug into sand or soft soil. Kingfishers are fiercely territorial in defense of their nests. The female lays about five eggs, and both parents share in the eggs’ incubation and raising of the chicks. The newly emerged hatchlings are altricial (naked and helpless) and require feeding by the parents, who bring the food into the nesting chamber. But the young grow quickly and are soon able to travel toward the entrance of the tunnel where they encounter the adults and wait to be fed. Eventually, they are fed on a perch near the entrance. Fledging can last a few days to a few weeks. After that, the young will be on their own and able to feed themselves. They are aggressive and fearless in defending their nests, attacking any animals that approach the nest too closely. They will even assail weasels, cats, dogs, and other birds. 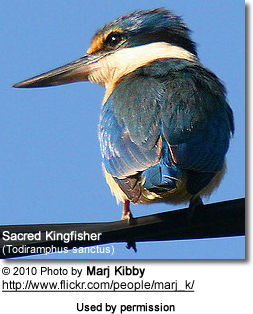 The Sacred Kingfisher can spot its prey from nearly 100 yards (90 meters) away! The bird darts out from its perch, dives into the water to seize the fish, then flies back to its perch to prepare its meal. 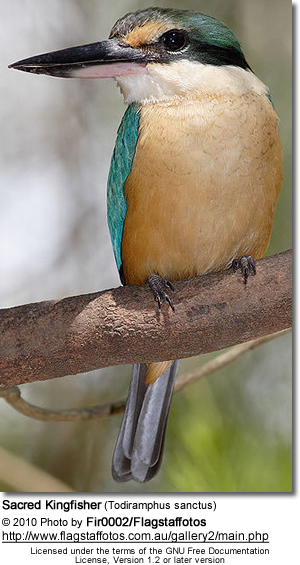 Like most Kingfishers, it pounds its prey on a branch to break its bones and make it easier to swallow. 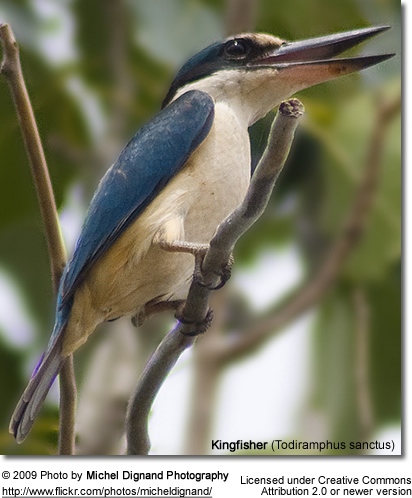 Most Kingfishers perch close to the water on low-hanging branches, but the Sacred Kingfisher perches on the tree’s highest branches where it can maintain a watchful, attentive eye out for its prey. These Kingfishers have well developed vision. Their dark brown eyes are able to see colors distinctly and are even capable of binocular vision. They are able to move their eyes within the eye sockets rather than having to rotate their entire heads to follow their prey. An unusual adaptation they possess is the ability to compensate for the water’s refraction and reflection as they search for prey underwater. This makes the fish look closer to the surface than it is. They have accurate depth perception as well. 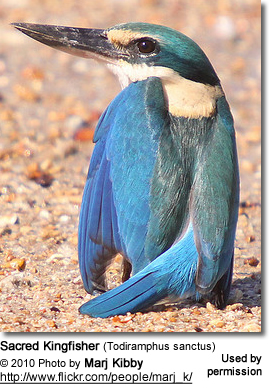 Nature has provided the Kingfisher with a great deal of ocular protection. Their nictitating membranes protect their eyes when they hit the water. 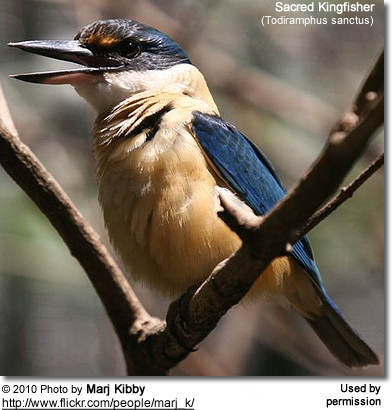 Kingfishers will stab their prey, either with the bill closed or open, depending on the size of the prey. 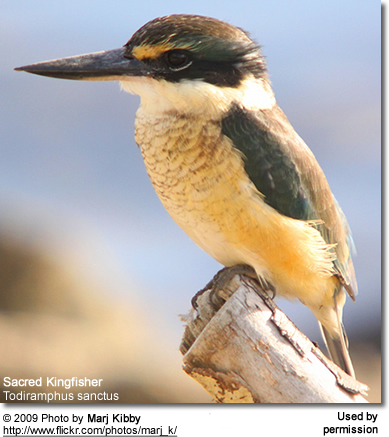 Kingfishers kill their prey by beating them on the ground or perch to shatter the bones. Then they work the fish into their mouths, head first, so that they won’t get cut up by the bones or scales as they swallow it whole. They will even consume snakes in this manner!